Hyundai is continuing to unveil their line-up for the 2012 SEMA Auto Show with the addition of an unbelievable Elantra GT developed in cooperation with Bisimoto Engineering. We say unbelievable because the tuning company has managed to scoff at the standard model’s modest 148 HP and juice up the engine to produce a mind-boggling 602 HP. How did they achieve this amazing output? Bisimoto Engineering got to work adding Arias pistons, Bisimoto con-rods, a Turbonetics turbocharger, AEM water-methanol injection, and Bisimoto high-pressure injectors. As a result, the 1.8-liter ?Nu? engine now delivers 602 galloping ponies for this little hatchback. In order to handle the extra power, the Elantra GT was also equipped with a new set of 18″ wheels combined with a progress coilover suspension and sway bar. Even though the engine upgrade is enough for any Elantra GT owner to drop significant cash on this investment, Bisimoto also added some exterior modifications to sweeten the pot. These mods include an ARK custom body kit and a Gatorwrap custom laminated body wrap. For the interior, the tuner added a JFN full roll cage, Bisimoto racing seats, and harnesses, all very much needed with the monstrous engine upgrade. Updated 10/30/2012: The new Hyundai Elantra GT Concept by Bisimoto Engineering just made its official debut at the SEMA Show, so we have added a new set of images, new video and new details on this astonishing concept car. 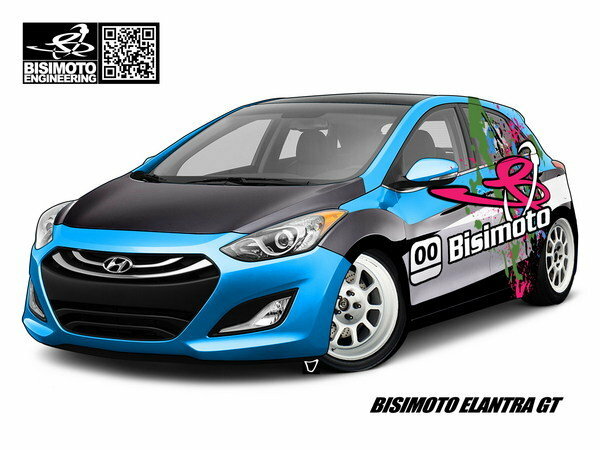 Hyundai Elantra GT Concept by Bisimoto Engineering originally appeared on topspeed.com on Tuesday, 23 October 2012 20:00 EST. Mazda has unveiled the MX-5 Super25 concept at the SEMA Motor Show. It was designed for endurance racing. Mazda has unveiled three CX-5 crossovers at the SEMA Motor Show. Two feature off-road inspired styling, while the other focuses on the street. An excellent insight into the world of F1 as it used to be can be found on the regularly-interesting Letters of Note website. It publishes a hitherto unseen letter from Jochen Rindt to Lotus boss Colin Chapman written shortly after Rindt?s crash at Barcelona which was a result of the wing system on Lotus 49 collapsing at speed. ?Colin. I have been racing F1 for 5 years and I have made one mistake (I rammed Chris Amon in Clermont Ferrand) and I had one accident in Zandvoort due to gear selection failure otherwise I managed to stay out of trouble. This situation changed rapidly since I joined your team. ?Honestly your cars are so quick that we would still be competitive with a few extra pounds used to make the weakest parts stronger, on top of that I think you ought to spend some time checking what your different employes are doing, I sure the wishbones on the F2 car would have looked different. Please give my suggestions some thought, I can only drive a car in which I have some confidence, and I feel the point of no confidence is quite near.? A little more than a year later Rindt’s Lotus suffered mechanical breakdown just before braking into one of the corners. He swerved violently to the left and crashed into a poorly-installed barrier, killing him instantly.